Radio pulsars in the Milky Way Galaxy rotate rapidly and steadily, and their radiation beams rotate with the pulsars like beacons in the universe. Among the more than 2600 pulsars discovered so far, the radiation of some pulsars shows strange characteristics, which include nulling, drifting and mode-changing. Observing and studying these radiation properties can help us understand the radiation mechanism and process of pulsars. 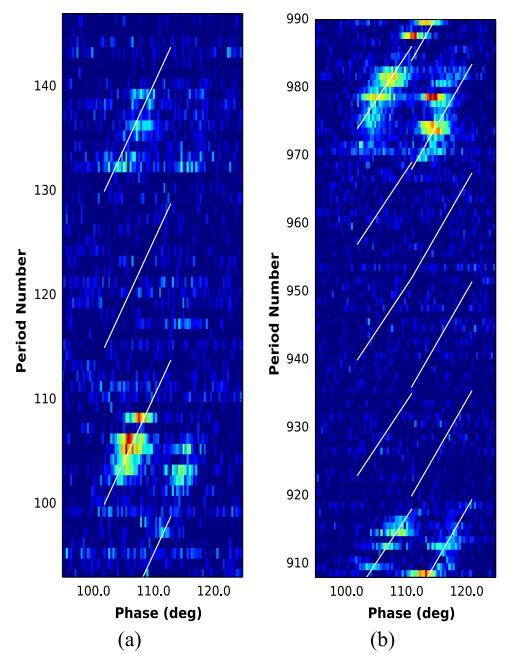 Pulsar group reports detailed investigations of nulling and subpulse drifting behaviors from two pulsars PSRs J1741-0840 and J1840-0840 using the Giant Meterwave Radio Telescope at 625 MHz. PSR J1741-0840 was found to show a nulling fraction (NF) of around 30% while PSR J1840-0840 was shown to have an NF of around 50%. They measured subpulse drifting behavior from different profile components in PSR J1840-0840 for the first time with those in the leading component showing drifting of 13.5 periods and drifting of around 18 periods in the weak trailing component. A more accurate comparison of the two driftband slopes was also made based on modeling of the subpulses, which revealed interesting sporadic and irregular drifting behavior in both pulsars. The researchers also identified unique nulling–drifting interaction in PSR J1840-0840 where, on most occasions, the pulsar tends to start nulling after what appears to be the end of a driftband. Similarly, when the pulsar switches back to an emission phase, it starts at the beginning of a new driftband. Such behaviors have not been detected in any other pulsars to our knowledge. They also found that PSR J1741-0840 seems to have no memory of its previous burst phase while PSR J1840-0840 clearly exhibits memory of its previous state even after longer nulls for both components. For PSRJ1741-0840, nulling shows quasi-periodicity but its profile does not show partial missing and lack of phase memory. This implies that the line of sight model is less likely to produce the quasi-periodic feature seen in PSRJ1741-0840. For PSR J1840-0840, nulling may be the result of an empty line of sight due to extinguishing sub-beam radiation from a break in the two-stream instabilities during a steady polar gap discharge. Once the residual potential reaches the maximum gap height potential, the pulsar attains a steady state during which no radio emission is emitted (null state). This work has been published in The Astrophysical Journal(ApJ，2017，850，173). driftbands. The white straight lines are not fit to the driftbands but shown here as illustration for the approximate locations of the missing driftbands.